Open ID is basically used for communicating purpose. Means one blogger can communicate with other using Open ID url. Now, when you make any comment by mentioning your blog url or your post url. Then, obviously the owner of that blog will delete your comment or make it spam. He/She thinks that you are trying to generate backlinks. In that case if you make comment using open id url. Then, you can get backlinks from these blogging websites and even this won't be considered as spamming. So, isn't it cool ? Don't you think so this is a very good and valid technique to create backlinks and open id url can be proved as backlink booster for you. In this way you will be also able to increase website traffic. OpenID (OID) is an open standard and decentralized protocol by the non-profit OpenID Foundation that allows users to be authenticated by certain co-operating sites (known as Relying Parties or RP) using a third party service. Using OpenID you can make comment on other's blog and comments will be made by your domain name. So, in this way you can get more and more backlinks that too without spamming. If you understood the importance OpenID url. Then let see, how to use your blog URL to comment as OpenID. You have to add one piece of code into your blogger blog template. Step 2 :- Now, go to Template >> Edit HTML. Take backup of your blogger template first. Find <head> section in your blog template. Step 3 :- Add the code mentioned below in <head> section. 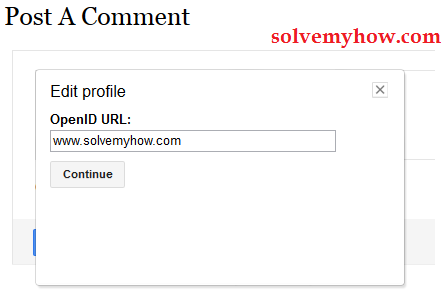 Replace "www.solvemyhow.com" with your blog URL. Step 4 :- Save template. That's it you just have added the code and now you can comment as open id url. Step 1 :- Visit any blog in which you want to comment as OpenID. Step 2 :- Select OpenID from comment option. Till now you might used to comment using Google Account, WordPress etc. But this time select OpenID and add url of your blog. Step 3 :- Write your comment and click on publish button. Now, blogger will ask you for verification of your site. So, simply login with Google account. Step 4 :- Click on "Yes, always" button. So, this dialog box won't open next time. After this your comment will be published and you simply created one free backlink. Go on comment more and create more spam free backlinks. Submit blog to thousands of blog directories to get backlink. So, this was all about how to use blog url to comment as OpenID. I tried my best to explain this article in easy steps. Hope you like this article. If you have any questions or suggestions regarding OpenID url then please comment it below this post. Don't forget to share this article with your social media friends and also subscribe for SolveMyHow newsletter to get blogging tips right into your INBOX ! You may check this post to increase more backlinks ! Good suggestions to increase our backlinks. Thanks for the writing such an useful post. Thanks for the writing such an useful post. you are genius! Thank you for your kind words. This always inspires me and glad to help you. Huyen find more blogs and comment on them, to get more and more dofollow backlinks. Thank you for your kind words. This means to me alot. I always get inspired from these valuable comments. Yubaraj why not help us by sharing this/other post with your social media friends, after all sharing is caring right ! Thanks for stopping by and commenting. Thanks for you valuable feedback. P.S don't forget to share this post with your social media friends.